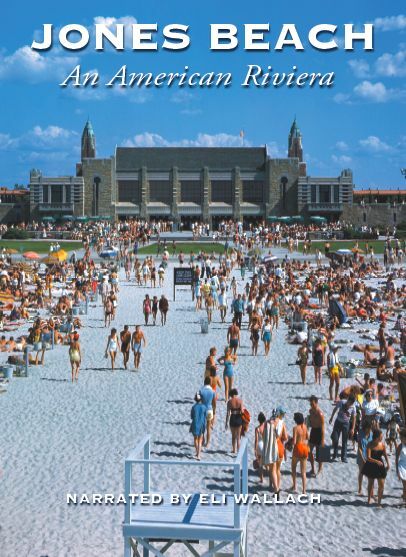 Jones Beach: An American Riviera explores the creation of a New York landmark by an American original, Robert Moses. Conceived at a time when park development was little more than an after thought for civic planners, Jones Beach was a revolutionary concept: an ocean playground for the urban masses. Built against tremendous opposition from xenophobic locals, the park was an engineering feat when it opened in 1929. Watching this film gave me a jolt of sweet nostalgia so strong, it was almost sepia-tinted. Jones Beach has been a staple of my life since I was a baby, but until I watched this wonderful film, I had no idea how hard Robert Moses fought to bring his dream to fruition. Backed by such bouncy old-time music as “Black and Tan Fantasy” and “Cheek to Cheek,” narrated by dulcet-toned Eli Wallach, and utilizing Michael Carmine’s exceptional cinematography, writer/producer/director George Pozderec shows how, in 1922, Robert Moses brought his vision of a “park built for kings” to the common man. New York was prosperous then, but the only place to go for recreation was the tacky, overcrowded Coney Island, referred to as “the American dream gone amuck.” Robert Moses realized that the perfect park could be built on Jones Island, one of Long Island’s south shore barrier islands that was only 25 miles from Times Square. At the time however, the island could only be reached by boat or ferry and Moses faced stiff opposition from Republican politicians and “Robber Barons” from High Hill, a private summer community located on Jones Island. Moses eventually teamed up with Alfred E. Smith, governor of New York, who insisted that the “downtrodden”—who the rich didn’t want on their sandbar—were his people. 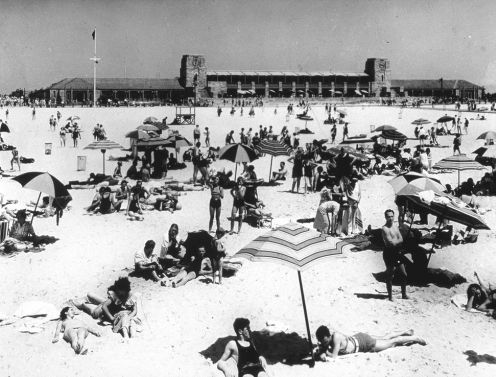 In 1926, the first marker for Jones Beach was driven into the sand. Problems dogged the project from the very beginning. Between 1927 and 1928 workers brought in enough sand to fill nine Hoover Dams to replace sand washed away by strong storms and waves that rushed clear across the island. While they worked, the new sand was subject to the whims of the wind; tools, autos, buildings were getting buried. Learning that beach grass would help, hundreds of workers planted it by hand all over the beach, solving that problem. Now that Jones Beach was becoming reality, roads needed to be built so people could get there. The Wantagh and Southern State Parkways were constructed to be lovely rides to a magnificent destination. 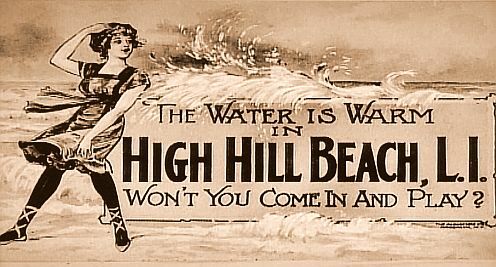 Jones Beach, an elegant, posh public resort with two bathhouses, dressing rooms, showers, and lockers, was created to be “happy palaces by the sea.” Everything was made with the most expensive materials. The finest water tower was a given, and Moses rejected many before deciding on one modeled after the campanile of St. Mark's Cathedral in Venice. He wanted visitors to feel they were approaching something truly different (and we do, each and every time, don’t we)? On August 4, 1929, FDR opened Jones Beach to the public during a howling sandstorm. Critics of the effort cheered, but the rest of the week proved sunny and hot; 325,000 cars came across the newly-completed Wantagh Parkway. Jones Beach was a success! People bubbled about the space, the gorgeous white sand, the heaven that was the Atlantic Ocean. From day one, quality recreation that, prior to Jones Beach, was only afforded to the very wealthy was now available to all. Barbara Paltrow, who grew up during the Depression, eloquently describes how Jones Beach provided for free, everything for entertaining a child whose parents couldn’t afford to send her to camp—swimming pools, archery, skating, shuffleboard, putting greens, circus, rodeo, exercise, dancing, and playgrounds. You could safely leave your child with Sioux Indian Rosebud Yellow Robe at the Indian Village all day to enjoy a real Indian experience. Jones Beach was better run, cleaner and better policed than a private club—but for the public. Many feel that Jones Beach truly came into its own during the Depression, providing an escape from monotonous jobs and stifling neighborhoods, affording an afternoon escape to a public park that could turn an ordinary day into a magical one. Many of the original structures at Jones Beach are in desperate need of an overhaul, which, hopefully, will be taken care of in the near future. My best friend, whom I’ve known for over 40 years, and I often take a stroll along the boardwalk at Jones, enjoying the sound of the ocean, the birds talking to each other above our heads, and the beauty of the setting sun. I love it there, and consider it Long Island’s legacy, something that belongs to each and every one of us. I just wish I could shake off the feeling that it’s slipping away. DVD extras include a Jones Beach photo album, a classic 1950’s travelogue of Long Island’s parks, footage of Jones Beach in the winter, and extended interviews with Daniel Baldwin, Nelson DeMille, Reggie Jones, Robert Caro, Ed Lowe, and Paul Goldberger. Editor’s note: I fell in love with Jones Beach: An American Riviera in 1998 when it first aired on PBS. I’ve been a fan of the documentary ever since and I think anyone who has an interest in Jones Beach or Long Island history would enjoy it too.